↑ "Geometric Methods of the 1500s for Laying Out the Ionic Volute" Denise Andrey and Mirko Galli, Nexus Network Journal, vol. 6 no. 2 (Autumn 2004), pp. 31-48. DOI 10.1007/s00004-004-0017-4. 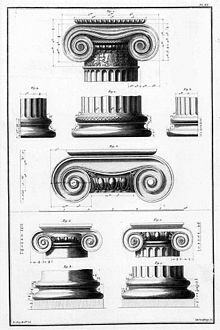 ↑ ((Rensselaer County Historical Society) "Architectural Styles in Rensselaer County" (New York); "Greece, the world's first democracy, seemed an appropriate philosophical reference point for a self-confident new republic." 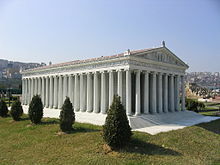 ((Old-House Journal), James C. Massey and Shirley Maxwell, "Greek Revival in America: From Tara to farmhouse temples.") are typical statements, selected almost at random from texts accessible on-line.